The Samsung Wallet app is out of beta in the U.S. but isn’t quite a digital wallet since you can’t use it to pay for things. Instead, it’s like Apple’s(s aapl) Passbook for iOS. In fact, it looks just like Passbook, which is sure to raise the ire of iOS fans. I’d love to take the app for a spin to see how it handles tickets and loyalty cards, but I can’t: Samsung Wallet is exclusive to certain Samsung Galaxy devices. According to the SammyHub site, which spotted the free app in the Google Play store on Friday, you’ll need one of the following devices to run the software: a Galaxy S 3; Galaxy S4, Galaxy Note or Galaxy Note 2 phone. If you have one of those phones, you can use the software to manage boarding passes, membership cards, coupons, and event tickets. That sounds familiar, no? It’s exactly what Passbook does on iOS devices: Provides barcodes and ticket information for such activities so you have them easily accessible when you need them. Ironically, this app is now widely available in the U.S. at the very same time that Google(s goog) is scaling back its own Wallet app. Earlier on Friday, Google said it would be removing loyalty and gift cards from Google Wallet on August 21 but would look to add them back in a different manner at some future point. 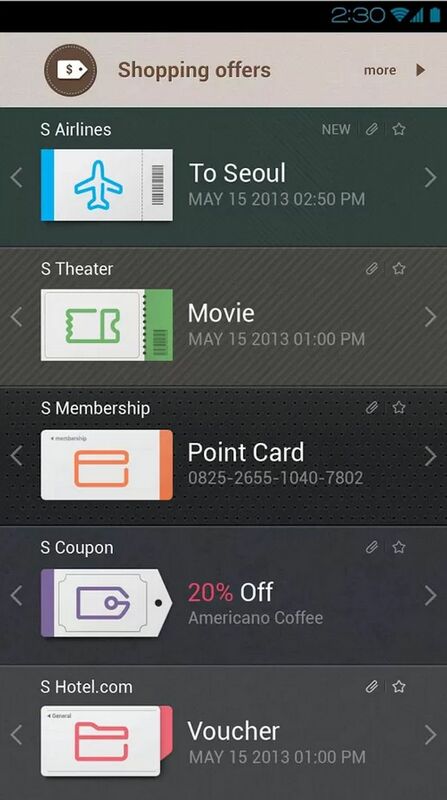 Personally, I’d rather see these wallet, coupon, and card features built into a single app available for all Android devices. Samsung is smart to take advantage of its Galaxy branding with Samsung Wallet, but it doesn’t help Android at large for device-specific solutions such as this. I have the Galaxy note 2. The app is not available in the UK.